Edge Two is for those who are becoming more established within their recovery. The sessions focus on theatre skills development and securing a greater understanding of drama as a tool for supporting recovery. Edge Two takes place every Wednesday, 6:30-8:30 p.m. at the Lillington & Longmore Residents Association in Pimlico. 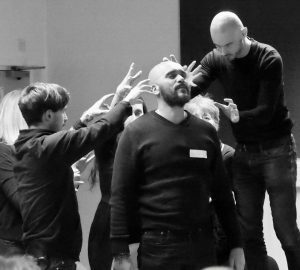 If you would like to develop more experience and join Edge Two, we require that you have shown commitment within Drop-in Drama, are well established within your recovery and understand the aims of OETC. Four times a year there is opportunity to join Edge Two depending on our programme of work; please contact OETC’s office for more information.